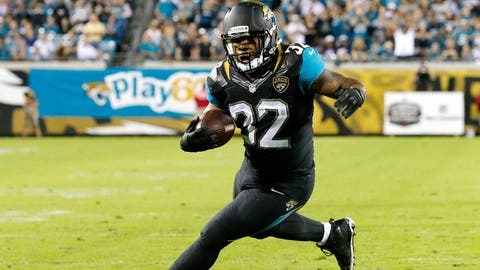 Free-agent RB Maurice Jones-Drew has spent his entire career with Jacksonville since being drafted out of UCLA in 2006. ALAMEDA, Calif. — Free agent running back Maurice Jones-Drew is coming back home to Oakland after signing a three-year contract with the Raiders on Friday. Jones-Drew returns to his native Bay Area after spending his first eight seasons with Jacksonville and starring in college at UCLA. Jones-Drew joins quarterback Matt Schaub, defensive linemen Justin Tuck and LaMarr Woodley and receiver James Jones as successful veterans brought in by general manager Reggie McKenzie this offseason who are looking for a late career spark in Oakland. "There’s a ton of talent here," Jones-Drew said. "Reggie McKenzie and his staff have done a great job of piling on guys that are coming from programs that are winning and know what it takes. Granted, most of us have chips on our shoulders, at least I feel like I got (done) wrong. … It’s something that’s going to drive us and push us to that next level." The Raiders also signed two defensive linemen, bringing back Pat Sims to a one-year deal and signing former Green Bay Packer C.J. Wilson. Sims played well in his first season in Oakland with two sacks and 41 tackles while starting all 16 games. He met with other teams before staying in Oakland, according to his agent Rick Smith. Wilson spent the past four seasons with Green Bay, recording 103 tackles and 3 sacks in 50 games with 11 starts. The Jaguars thanked Jones-Drew for his work on the field and in the community. "Maurice’s toughness, determination and competitive spirit on the field served as a great example to all of his teammates," the team said in a statement. "Maurice has been one of the great Jaguars and he holds several team records for touchdowns that will remain for a long time. His place in Jaguars history is firmly established and we look forward to honoring him in Jacksonville at the appropriate time in the future." After more than two weeks on the open market, Jones-Drew finally found a new home in a familiar place. Jones-Drew grew up in the East Bay town of Antioch and starred at nearby De La Salle high school. Jones-Drew still spent his offseasons in the Bay Area and looked forward to being able to keep his family in one place and that his grandmother will now be able to see him play in person more often. Jones-Drew has gotten hurt the past two seasons when playing the Raiders in Oakland. He missed the final 10 games in 2012 after injuring his left foot at the Coliseum. He strained a tendon in the same foot when playing the Raiders this past season. After ranking second in the NFL with 4,321 yards rushing in a three-year span from 2009-11, Jones-Drew has been limited to 1,217 yards in 21 games the past two seasons. He averaged a career-low 3.4 yards per carry last season. That has led critics to argue that Jones-Drew has lost a step at age 29 and is on the downside of his career. The Raiders are hoping good health will help Jones-Drew return to the elite form he had before the injuries. "I have a ton left in my game," Jones-Drew said. "People tend to look at running backs and say, `Oh, you’re 29, you don’t have anything left. … I feel like I have a ton left in the tank and I get an opportunity to show that here in Oakland." The Raiders needed help at running back after allowing Jones-Drew’s former backup in Jacksonville, Rashad Jennings, leave through free agency to sign with the New York Giants. Oakland did bring back injury-prone starter Darren McFadden on a one-year deal but has no other proven tailbacks on the roster. The Raiders are hoping last year’s sixth-round pick, Latavius Murray, can contribute after spending his entire rookie year on injured reserve. McFadden has missed 29 games over his six-year career with injuries and has averaged 3.3 yards per carry the past two seasons. Jones-Drew said he was told there will be an open competition at running back between him and McFadden. "He kind of has a leg up on me because he’s been in this offense already before," Jones-Drew said. "My job is to come in and to compete to play. We both have something to prove and that will help us all out in the long run, competing and being able to push each other."